Habitat: This eel prefers deep, rocky pools with suitable caves and rocks for hiding from predators. Also found in large bodies of water such as certain dams. Distribution: This species can be found in East coast rivers and upwards. 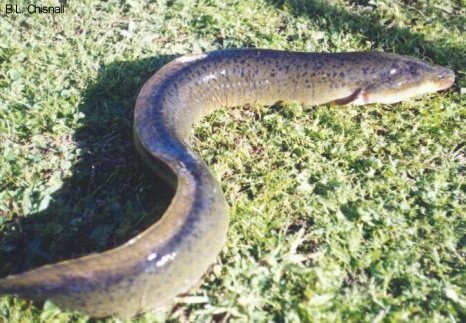 Bait: Longfin eels will eat just about anything such as crabs, frogs, earthworms etc. Description: This species is long, smooth skinned with a snake like appearance. Colour changes as the species goes to sea. Colour will change from a grey to a dark bronze colour. Fishing Strategy: Use strong line, when the eel is hooked it will retreat to any rock or cave. The angler will need to set the hook and keep pressure on the fish to avoid the eel going into a cave. If the eel goes into a cave, then the line will wear on the sharp rocks and break.